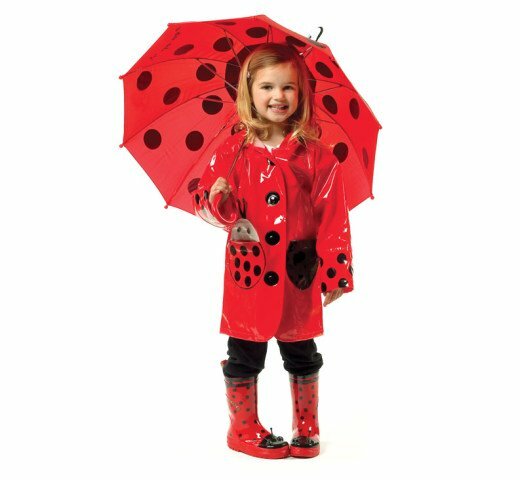 Those monsoon rains won't stand a chance of creating a gloomy day when this Kiddorable Ladybug Raincoat is on the job! Any little girl would be lucky to find herself decked out in this sensational coat. It's a fine tribute to one of the garden's favorite insects. You'll always find your daughter in any crowd when she's dressed in bright red! Select the right size from 12-18 months to 6/6X. The soft rubber coat comes with an elastic button hood. Matching umbrella and boots sold separately. For more information or to order, click here.